This here, is my very first blog post. December 1st, 2010 just seemed like a well-rounded place in time to start my creative journey, in art and in life. I have been yearning – YEARNING for months on end, I tell ya – for a creative outlet to share with others. Nothing too formal. It’s more for personal growth as an artist and a freelance creative. It’s just that, lately, I’ve had an enormous amount of creative energy bundled up inside of me, and it just simply needs to be -oh, I don’t know – unleashed and nurtured…embraced and sustained. And in the process, I’d like to inspire others to nurture their creativity as well, and encourage them to pass the goodness along to the next person. The source of this creative energy is different for everyone, whether it comes from their mind, heart, or soul, and the source of inspiration may come from an endless array of possibilities, such as music, nature, or people. These are the kinds of things that I’d like to start sharing. My goal is to inspire others artistically. I’d like to help spark their creative processes by sharing some of my personal work and also share the inspiration and talent of other artists (and non-artists) who are tapping into their creativity and influencing the world in a positive light. Great (here come the inner demons), “What are you getting yourself into???? You hardly have enough time to write articles in your other blog. You don’t have time for this nonsense. You already have multiple creative outlets. You’re too busy…blah, blah, blah…” True. I do have a lot going on, and I am sure you do, too. Life whizzes by a million miles per second. But I have been compelled to share this creative passion with others that are like-minded, and as of late, it seems that I have been surrounded by people in my life who are on the same journey. Call it crazy, call it ambitious. Call it what you want. My mission is simple: step it up, create more, influence others creatively, and share it with the world. “INFLUENCERS is a short documentary that explores what it means to be an influencer and how trends and creativity become contagious today in music, fashion and entertainment. 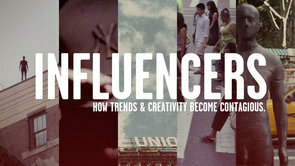 SO TELL ME, MY FRIENDS, WHO ARE YOU INFLUENCED BY IN YOUR LIFE, AND HOW DO YOU INFLUENCE OTHERS?